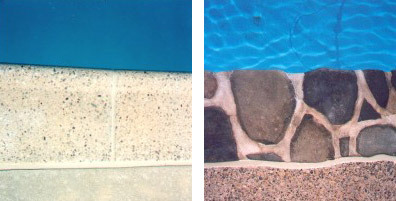 A specialized caulking, called Mastic, is installed in the expansion joints between the coping and decking of the pool and in any gaps found around masonry. When Pools, Patios and Walkways are built certain controlled expansion joints have to be created. These gaps are necessary to allow for settling and insure your pool deck has room to move without causing damage to the pool itself. One of the most important controlled expansion joints exists between the swimming pool coping and the decking around the pool. When the pool is first put in there is a white foam expansion joint installed prior to the pouring of the decking. 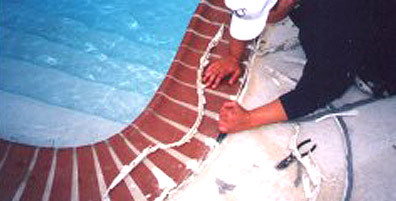 This foam material acts a form to create the expansion joint around the pool's perimeter. The foam does not seal the joint, and quickly deteriorates. It needs to be removed and a urethane sealant installed in its place. Whether the swimming pool/patio is brand new or many years old does not matter - the foam that was installed to allow for the initial settling should be replaced with a specialized caulking. This is an essential preventative maintenance step that also gives a finished look around the pool. The expansion joint is sealed with a self-leveling material designed specifically for this purpose. This engineered urethane sealant is the highest quality material that can be used and will insure a lasting seal. We offer the mastic in several colors to compliment the existing coping and decking. We are able to install these coatings and sealants around your pool so that they not only protect and maintain your original appearance but add to it. We do this by offering colors that complement your pool and its surroundings. Allow constant water from swimmers and the elemenst to begin to erode under the decking and the pools beam. This is not a do-it-yourself job, or one to be undertaken by anyone without specifc product knowledge. The urethane sealant is difficult to remove from any surface once applied to and for that reason experience is the key. For MSDS, architectural specifications and technical properties of the Tremco sealants PoolSeal installs, please visitTremco.com. PoolSeal is an authorized installer of Vulkem 45 SSL, Tremflex S/L, Dymonic and Vulkem 116 products.